Spring School holidays Afternoons from 13 H 30 (Depending on the weather conditions). By reservation. Weekends and Bank holidays May, June and September Afternoons from 13 H 30. By reservation. From June 15 until school term start Daily from 9:30 a.m. to 7:30 p.m. without interruption. Latest departure at 17:30. Reservations are recommended. FOR GROUPS (school, CE, Sports clubs ...) Open by appointment outside these periods. Only in the morning during peak season. Between Vauveix and Broussas on the banks of beautiful Lake Vassivière, the tree tree ® park, new generation of parks offers 91 activities to consume without moderation, alone, in groups, with friends, with family. 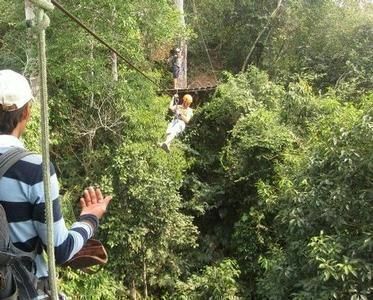 Discover the forest for a period of about two and a half hours through fun and air activities, emotion, thrill, sensation and guaranteed safety. 5 junior courses / adults.